If you’ve got a pet land hermit crab, make sure that you let any water that you will bathe it in or give it to drink sit out at least overnight. This will allow any chlorine to evaporate, which is important because chlorine can cause blisters on the gills of land hermit crabs (yes, they do have gills, but these are for breathing air. They still must be kept moist, which is why your land hermit crab should be bathed once a week.) 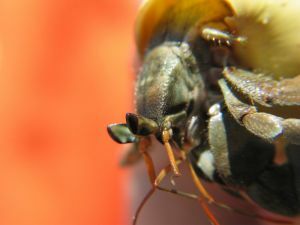 The blisters can eventually kill the hermit crab if the chlorine exposure is not corrected. Basically, don’t use any water for your hermit crab that you wouldn’t use for a tropical fish tank.